I bought my truck in July 2012. Pretty much been battling a fuel mileage issue since then. 07 Century, 14L EGR Series 60, 13 spd, 3.42 Meritor 14X rearends. Mind you, my mileage isn't horrible, it's 6.2 mpg for an annual average. All miles actual and all fuel counted for the year. My issues is the RANGE. I was seeing from a low of like 4.6 to a high of 8.87. Gotten rid of ALL recaps and gone to GY 399L steers, Firestone FD695+ drives, BFG 720 drives and Double coin trailer tires on the trailer. All virgins. No recaps. Exhaust Manifold gasket replaced. After the first Manifold gasket replacement, turns out my silicon boots between the Turbo and CAC were leaking. Replaced both of them with all new clamps. Had the ECM tuned on a chassis dyno. Putting 550 hp and 2060 Ft-lb torque to the ground. Yop, it'll pull. Had the overhead ran. No significant improvement. replaced the ECM to firewall wire harness. If you drive a Freightliner, I'd pay REAL close attention to it. There's a 10 ga battery positive wire that runs through this bundle. The sheathing had rubbed through large areas of wiring where it makes sharp bends over the ECM and the starter. It WILL shut your truck down on the side of the road, and if that BAT+ wire rubs and shorts, I can see it being a fire hazard. Found out my CAC was seriously leaking. Took some windex and just fast idle to find this issue. I had it in 4 times to have it tested for a bad CAC. No one found it. Replaced the power divider. Input shaft bearings were TOAST. This was kind of suspected back in July after I got the truck home. My mechanic had gone in and tightened up the input yoke on the power divider. We just kind of ran it and kept an eye on things but it lasted 85,000 miles after I bought it. CLEAR-DIESEL® Fuel & Tank Cleaner and one 80 oz bottle of Emergency 911. I have been averaging 28,000 miles on a filter now since I put in that fuel cocktail to 240 gallons. Prior to that, about 7,000 to 9,000 miles. I even made a filter setup so I could try and clean the fuel at night after driving for the day. Replaced the entire exhaust manifold with new. Center section was showing hairline cracks and there was soot behind the manifold. Turns out it was the EGR to Manifold joint that was leaking. I pulled my map sensor out and decided to clean it with ether. Seems to have helped. Since it helped, I just changed both the MAP and the boost sensors. I was starting to show similar behavior to what happened the first time I replaced the exh man gasket so I checked all my clamps again. Yop, two clamps loose like 6 full turns and leaking. Big ol' bubbles blowing out. As a result of the manifold replacement, I came down Bozeman pass in Bozeman MT and the exhaust pipe came off the turbo. I have no clue why other than there was NO nut on the turbo clamp. The pipe itself you could see was damaged from being tightened like it was installed incorrectly. In Mt Vernon WA, I noticed I was up in fuel mileage again. I got to thinking...All my best mileages occurred in Boston, Florida and now Seattle areas. What do ALL those areas have in common compared to running in MN and the upper plains? Sea level vs 900-1000 ft in elevation. I pulled into the Freightliner dealership and asked them about if they could map the range on the Baro sensor. Yop, you guessed it..."deer in the headlight" look. "Two hour minimum to hook up the computer. $250 charge." And how much is a sensor? $113. Bought the sensor and put it in. Fueled in Sumner WA and drove to McMinnville Or to Ontario OR. Gross weight, 70,0000. 7.21 MPG Hmmm.....Lot of 2500 ft pulls between 2000 to 4400 ft there. I remember 4 pulls at least in there. Ontario OR to Laramie WY 6.54 mpg. Hmmmm... You climb to 7800 feet from 4000 feet in Ontario. SEVERAL times too. Three Sisters on I80 are in there too. Today's fuel mileage according to the dash sucked. But across NE, there was a 20-40 mph cross wind at 90 degrees. I was still above 6.4 mpg according to the dash. I'll be fueling on Tuesday sometime and have a better idea what the mileage is. Two things. I am pulling hills in a gear higher than I had before. The truck hasn't gone below 6.1 MPG on the dash yet. In the crosswinds I had coming across NE today, I would have been low 5, high 4's for mileage easy. replace your CAC when needed. No exhaust or turbo leakes. CRITICAL here. Replace fuel and air filters on a regular basis. If you can't get any other things to better your mileage, consider $200 worth of sensors. MAP, BARO and boost sensors. They get dirty and seem to really make a difference. So what do these sensors do? Boost sensor is obvious. It tells you the level of boost the engine is seeing. MAP sensor tells the engine how much load is on the engine. Compares the manifold pressure to atmosphere. BARO sensor basically is telling the ecm what the altitude is. Changes the fuel and timing curves as a result. 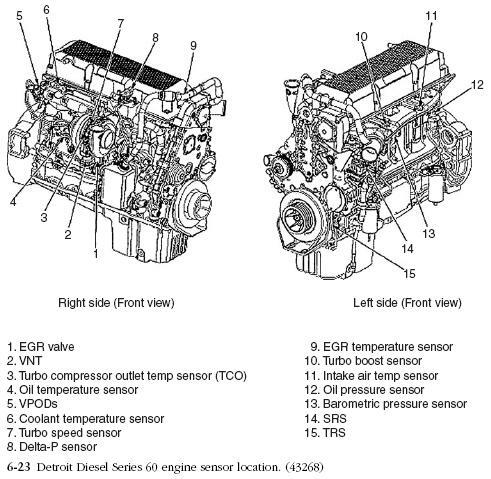 I was able to find this in the EPA 04 EGR tech manual. Good luck it would seem getting a service shop to understand it. If the sensor readings do not differ more than 4.14 kPa (0.6 psi), task is complete. Replace the CAC and immediately retest. Bad about leaking right out of the box. Haven't found a leak on the new one at all. Testing with a soap solution has now become a regular inspection item. Inspecting for a leak using soap solution is a good first step, but actually applying pressure to the CAC, actually everything from the turbo to the intake manifold, is the best way. 35 psi and a loss of over 5 lb in 30 seconds is the boundary line. I actually am more critical.... 3 lb in 30 seconds. If the loss is greater than the baseline, then CAC needs replace. I have this test done annually along with doing the overhead adjustment. I had the shop in Washington, local shop I used when the overhead was ran and the exh man gasket the first time was replaced and a third shop when my delta-p sensor failed all run that test. None of them found the leak doing the test you described. Simple Green spray bottle works good for finding leaks. Bubbles up real nice and easy to put on stream and shoot. I've already seen two shops using it. My average mpg is now around 7.1 up from 6.1. Empty, my dash has shown as high as 9 mpg. Loaded at 73-78k gross around the house in MN, I've been seeing 7-7.1. On the really windy days we had last week running into 20-30 mph head wind, 6.7-6.9. Those numbers are from the fillups not going off the dash readout. It also showed me depending on the idle time, my dash readout is accurate. This all happened after I changed the baro sensor. I took a day and swapped the old on back it. Instantly dropped back to less than 6.0 mpg. I put the new one back in and I was back up to 7.0 mpg. Engine is much more responsive too. I have a table for what the baro pressures should read for altitude and an idea to create a test chamber for a baro sensor. Now to figure out how to get something to read that sensor. This all happened after I changed the back sensor. What's the back sensor? Baro? Bad auto correct from the phone. I went back and corrected them. How much was that sensor and where is it? It's above the starter and below the intake manifold. The damage to the wiring harness.I can't edit my original post, but this was the damage to my wiring harness at those sharp bends from the ecm to the firewall. If you look real close, you'll see a larger wire in this bundle that's starting to wear through too. That is a 10 GA wire for battery power to the ECM near as I can till. It goes straight back to the battery and has no fuse protection on it at all. I forgot about this little gem. It's the fuel line from the DAVCO to the fuel pump off the air compressor. It had a nice bend to it and was restricting the fuel flow about 60% or better. It got replaced with a line about 6" longer. This is the leak from the CAC. Soap found it at 1000 RPM high idle., no explanation why the pressure test wouldn't. At high idle, the system is only building about 5 PSI according to my gage. I was thinking. No wise cracks. Why wouldn't the computer pick up on that sensor failing and I realized it can't. The only way would be to visually see the pressure it's seeing and compare with the pressure outside where you are at the moment. not really sure. I've talked to a couple shops since then and they aren't happy with the Detroit test for it either. When they have complaints like mine come in, they replace the sensor and tell em to come back in a month with a new fuel sheet. So when you consider, "am I getting poor fuel mileage?" Now I have to ask myself, "WHERE am I getting fuel mileage also?" Elevation or sea level. Same thing with a planes altimeter, it can't calibrate itself either. Every time we land at an airport we get a barometric pressure reading and dial it in or set it to the field elevation. That's basically the premise for my testing the Baro Sensor. You place it in a jar you can change the pressure in and then look at the reading as you map the sensor range. I tried to ask the freightliner dealer in Mt Vernon WA to do that and the service guys just looked at me like a deer in the headlights. Their best answer was there is a two hour minimum for diagnosis and that's $250. Aaaah, thanks. I'll just pop in a new sensor. Cheaper that way. It's kind of hard to test a barometric sensor. You need to apply power and use a computer to read the power draw. It's pretty much the same sensor I used in my computer weight gauge I made for my truck and trailer. There are two types of barometric sensors. Mine uses an differential sensor. That means it was sealed up at sea level so altitude does not effect it. The truck uses an absolute sensor which changes depending on altitude. Great. Now even Skateboard is making fun of Skateboard.